The posters all define the film as 'the musical phenomenon' and boy they weren't kidding. The music, as anyone familiar with the musical will already know, is the film's biggest asset, with a lot of the numbers being incredibly powerful and moving; 'I Dreamed a Dream' particularly so. Anne Hathaway, who steals the show and buys herself an Oscar, is absolutely mesmerising and heart-wrenching in every scene that she is in, and the simple one shot rendition of the iconic 'Dreamed a Dream' song epitomises this and is far and away the defining scene of the film. After watching him play Wolverine for the best part of thirteen years, Hugh Jackman when thrust into the leading man role reminds us just how much of a musical talent he really as Jean Valjean, and Russell Crowe who makes up the other part of this two man rivalry, Javert, remarkably manages to defy all expectations and hold his own impressively well up against the heavy weight singing talents of the film - especially when in duet. Whilst it may be easy to dismiss them in a film that is supposed to be so, well, 'Misérable,' Bonham Carter and Baron Cohen deserve as much recognition for their parts as the comic relief, with their main song 'Master of the House' also being one of the highlights for me. Not to be overlooked: Helena Bonham Carter brings a much needed comic relief to a Misérable film. Having not seen the musical or having a huge amount of knowledge about it prior to seeing the film, I was unaware of just how musical the film was - I just expected the usual musical format of the occasional song and dance. In fact the film is essentially one giant song, with each song flowing into the next and all dialogue being delivered lyrically. It really is an impressive feat, and this combined with the epic scale of the story creating the feeling that the film you are watching really is something extraordinary and a real cinematic event. It's unlike any musical that I have ever seen before, and certainly puts in a strong case for 'the musical phenomenon' title that the film has awarded itself. But there's a problem; clearly I have a lot of admiration for the film, why then is it that I didn't find myself sobbing at it like the rest of the audience? My big problem with Les Misérables can be summed down to just one word: theatricality. There are a number of elements of the film that evoke a sense of theatricality, including the melodrama of the musical element, although as this is a musical film that isn't the issue here; in fact it is the film's greatest asset, although it does help to highlight this problem as you are watching what is essentially a near 3 hour long song! Whilst I still believe that Hooper is a very good and promising film director, his decision to focus on the faces of the characters a lot (including shots that track them face-on as they move and sing) evokes a sense of the stage show with the characters always singing out into the crowd. This paired with the heavy use hand-held camera shots gives the film a sense of realism that doesn't make you feel like you're in real-world 19th century France, rather more like a high budget filming of the stage show itself (just with a fully realised environment). 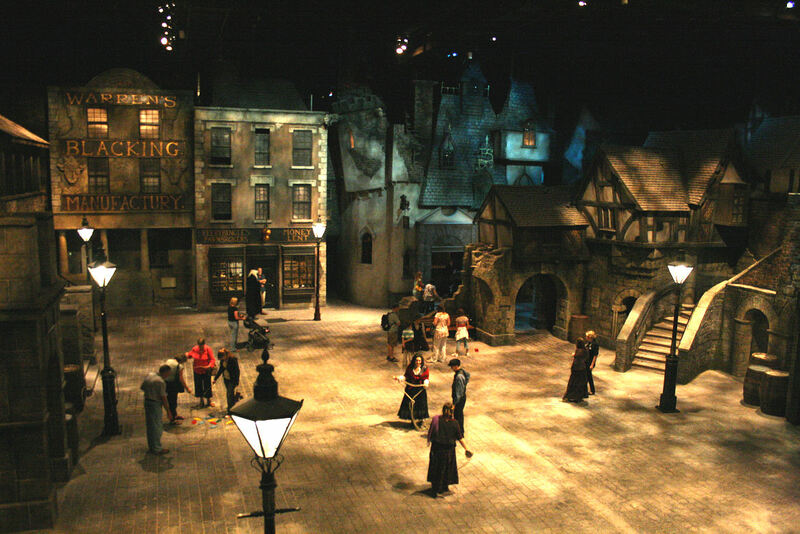 Production design also adds to this issue, with some of the albeit amazing set designs feeling like the stylised sets of false wonky building designs that you would in fact see as the backdrop of a stage musical - watching the barricade scenes feels closer to being in the courtyard of the Dickens World attraction than a French town itself. I wasn't transported to the real 19th Century France; I was transported to a stylised fibreglass set piece. The problem with the production design isn't aided by its own inconsistency, with the reality of the on-location shot scenes, the non-reality of the occasional CGI heavy shot (and often blatant CGI backdrops), and the theatricality of the set designs never gelling together to create a coherent, immersive world. This also goes the same somewhat for the make-up that make the grimy prostitutes look more like pantomime dames! Taking up the best part of 3 hours (with its 157 minute run time), I will also argue that the film is too long (Although truth be told I'm just thankful that Peter Jackson didn't direct it as it would have taken two films to get through!). Although it is difficult to condense a film that is on such an epic scale, it could have been tightened up at parts to adapt it to the big screen. This in turn ties nicely back into my problem with the film's theatricality, as if you were to watch Les Misérables on the west end stage you would have an interval mid-way through, which you no longer get when watching a film at the cinema. Apart from the lack of an interval though, the film does naturally follow a stage show structure, with typical stage ploys such as the two comic relief characters appearing on cue just as they might as a large set change happens behind the curtains on the stage version. It's minor things like this that subconsciously evoke the feeling of watching a stage show performance. Now these are minor issues, some of which may not even be considered an issue at all, however it all works towards a strong sense that all I was watching was just the musical on the big screen - which for fans of the musical may sound like a dream I dreamed come true, however in being adapted to the big screen I want to see Les Misérables the film, not Les Misérables the stage show. Regardless, the main issue hasn't even come to light yet! The sum is greater than the parts of the whole, and all of these small elements combined to create this notion of theatricality that had me constantly thinking of the film as a performance. Despite the fact I was sat thinking 'blimey, this is a ruddy amazing performance,' the fact of the matter remains that I was thinking of it as a performance nonetheless, rather than being enveloped in the drama of it all. 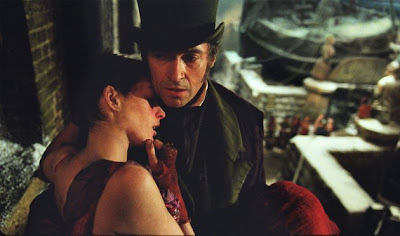 Even though I loved the performances, I never felt that I was watching Jean Valjean, it was always Hugh Jackman playing Jean Valjean, albeit incredibly well, but it's a feeling that takes the edge of the drama and emotion off of the film through a loss of immersion and believability. And in a film called Les Misérables I think you can imagine why that sense of drama is an important one. Unfortunately, Anne Hathaway's Fantine aside, I never felt the full extent of this 'Misérable' element. 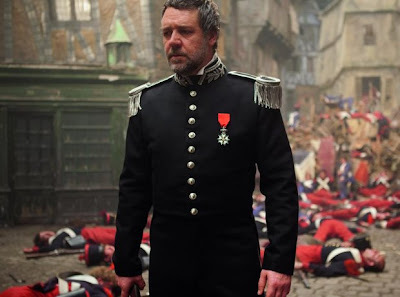 Despite feeling like I was watching something really epic and special whilst watching Les Misérables, with the exception of the show-stealing scenes with Anne Hathaway I simply struggled to get as misty eyed as everyone else did after failing to completely connect with the story and its characters. When all was done and the final shot cut to black, the entire sobbing audience of the filled theatre went up in a round of applause, and I felt the urge to do so as well, but not in emotional admiration at what I had seen. The theatrical elements and structure that made the film feel like a large budget shooting of the stage show made me feel the compulsion to clap as one would at the end of a stage performance; if I had wanted that I would have just gone to see it on stage instead! Les Misérables is still a remarkable piece of filmmaking, and is certainly a must see, but for me at least it is let down by a sense of performance and artificiality that prevents it from being the masterpiece that it could have, and perhaps even should have been. 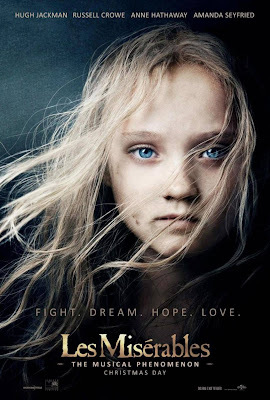 Les Misérables (certificate 12A) is now showing in cinemas across the UK. Have you seen Les Misérables? What did you think of 'The Musical Phenomenon!?' Leave your thoughts and opinions in the comments section below! 12 of '12! Part 2. 12 of '12! Part 1.